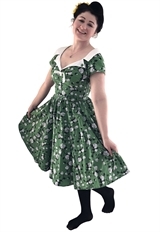 This dress features a narrow lapel folded down to the bust on each side with buttons and button holes and a pre-formed ribbon bow at front. Functioning side seam pockets. Removable belt. Side zip. The petticoat is not included. Standard size approx. length: 39 inches; Plus size approx. length: 42 inches.